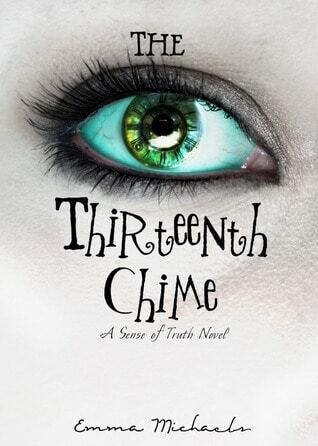 After reading several other reviews for Emma Michaels’ YA debut The Thirteenth Chime I was thrilled when we were offered it for review courtesy of the author. If her name sounds familiar to her, you may have come across her own book review blog. I’m always happy to cheer on people who have worked hard to achieve one of their biggest dreams, and in Emma’s instance, that was becoming a published author. The Thirteenth Chime has an “eye-catching” cover that will lure you in and get you interested in learning about the story. I’m not sure that there is just one way to classify what this is all about, but if I had to affix a label to it, I would call it a ghost story. There’s a bit more to it, but those specific plot elements were merely hinted at and will play a larger role in the upcoming sequels. Destiny and her roommate/best friend Stephanie head off to Steilacoom (a port town of Washingon State) to meet up with Stephanie’s mother Leslie, who is renovating a beautiful cliff-side Victorian-era home. When they arrive, though, Destiny “senses” something in the house and is significantly creeped out by an antique grandfather clock that was brought down from the attic. That same night, the grandfather clock chimes an extra strike and Stephanie and Leslie end up in the hospital. She knows she shouldn’t, but Destiny calls David, her ex-boyfriend, believing he is the only one who can help her discover the cause of her friends’ horrific attack. David immediately flies to the small island to aid Destiny, although they have been out of contact for some time and Destiny is now engaged to another man by the name of Scott. He becomes just as consumed by the events which occurred in the house, and traces the origins of the grandfather clock. What he finds is both astonishing and frightening–and involves his own past and future. I truly love the premise of the novel, but I was disappointed in its execution. All of my college writing classes really focused on the importance of “showing” rather than “telling”, which means that the author should use descriptive language in such a way that it makes the reader feel something for the current situation and the characters. Unfortunately, I found her writing to be really flat and cardboard. Editing is also very important to a finished work. I would have been able to appreciate everything I had read–if this was a really early draft. The copy I was received was the finished product, and I’m not doubting that the author worked really hard to complete her story. A lot of the fault here rests with whoever was in charge of editing copy. Some of the most common mistakes I saw were misuse of commas and question marks, redundancy, and subject/verb disagreement. However, an author should still polish the novel to the best of his or her ability before it reaches the editor. There are plenty of terrific resources to use (Elements of Style, for one), and I keep several on hand for when I am in doubt of what I’ve just written. One could also Google to find sources of information and grammatical/spelling assistance. The climax is one of the most exciting parts of this novel–also one of the most important. One of the more “realistic” scenarios came across as utterly unbelievable. *SPOILER ALERT* David takes a small boat out into a storm. He has no experience on the water, and I don’t believe that anyone would just allow him to go out in this storm. I would have been more forgiving about it if Scott had fought with the man to gain access to the boat, but the man gives in very easily. *END SPOILER ALERT* This is also around the time when readers finally get a glimpse of what has been terrifying these poor people, and where detailed description would be a powerful tool. Instead, the most we are offered is, “mangled thing” spaced about a page apart from each mention. I’m not familiar with Ms. Michaels’ publishing house (Bokheim), but if they do not offer editorial assistance, it may be in her best interest to seek out an editor of her own. While feedback from friends and family can be helpful, they aren’t trained in this field. I wish Ms. Michaels all the best with future publications, but hope that she’ll consider taking a writing course to strengthen her craft and working with an editor that can give her work the attention it requires.